I have to stop, take a break and realize ….I’m stressed – but I’m happy. Happy that I have almost all of my family home. We’ve marked another year – Christmas to Christmas. I sprung out of bed in the dim morning light– with visions of butter tarts, not sugar plums, in my spinning Christmas Eve head. The house was peaceful and silent while I whipped egg whites and chopped dates for the buttery tarts, everyone else still dreaming of a white Christmas – but the household is hopping now. My husband just rushed out for some mysterious last minute shopping. Cole, our eldest son has had to make his morning green smoothie amongst my cooking mess, and then he flew off to replace a left-behind cord for his camera to enable him to record all aspects of the planned Christmas Eve merry, merry merry-making. His brother, Hudson, slept later, not at all panicked about gifts he still has to find with so many males of the same ilk, who will flock to the malls. 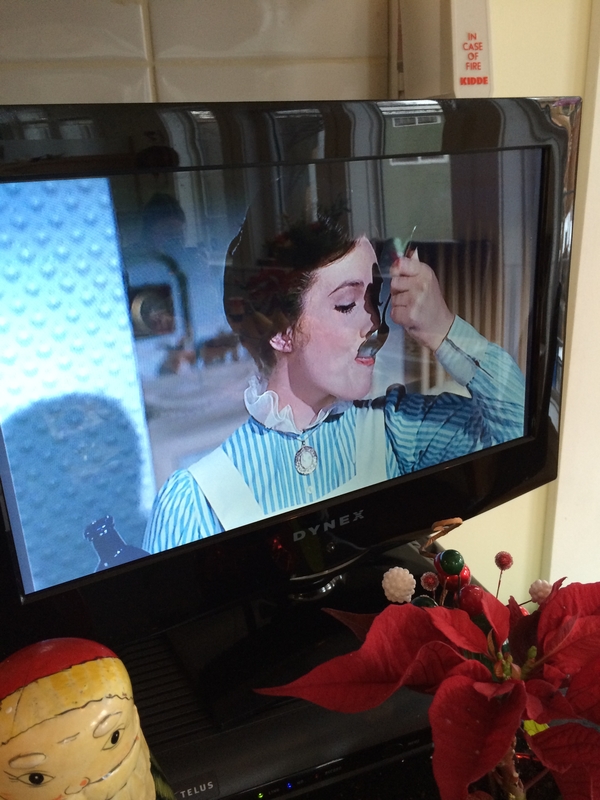 Lily, our youngest daughter has found the two of us the Mary Poppins movie on the kitchen television and is going to wrap, tape and festoon her carefully selected gifts with bows, while I try to focus on the next special dessert – and we both sing along to Chim Chim Cherrie and A Spoonful of Sugar. I’m scattered, getting out the fancy dishes one minute, mashing potatoes for the Romanoff the next, only to be interrupted by a call for more tape, and then seeing the tree needs to be watered, before locating the chocolate mint pie recipe and texting hubby to remember the whip cream. For only the second time ever in thirty years our kids will not all be present – but our eldest, Zoe, is bound to have a jolly holly time with her husband and sweet small daughters – who will share their excitement for the Big Guy in the red suit’s arrival with their other grandparents in a cozy cottage in the mountains. So I tell my other grown kids, who feel a little blue about missing their big sister – we need to share her, and we’re sharing her with good people. All truly is fine. I am the mom. And I do ‘manage’ Christmas in the house like so, so many moms. And I see that the clock is ticking and the iconic wife saver (egg strata) for tomorrow’s breakfast isn’t made, the crackers for tonight’s oysters must be crushed, the salmon dressed, and the cream whipped and the stockings found and the punch stirred, and the chaos tidied, and on and on and on. Oh my, those tarts look heavenly! I have my eldest in Jerusalem (where she lives) and our oldest son is in Australia for a year– having them all home is a fuzzy dream. Happy New Year, mom… from another mom. My grandmother’s buttertart recipe. The eldest daughter will enjoy such a tart, the youngest daughter never has, and both sons have gone all ‘health conscious on me’ – bless them and there kale and broccoli shakes. So excited to see you writing for The Huffington Post – hope you read my book some day – love to share it with you mom to mom. Ahhhh….just about finished my first glass of post Christmas Eve worship services port! Thinking my son is till at your home, and maybe soon making his way here…but imagining that I may be sound asleep before he arrives. Christmas blessings, sister! And to you to sister. Safe travels – love ya! Love to you all from all of us here, doing very similar things! Merry Christmas!